Will your new Ford Focus EV charge faster than that other guy’s new Nissan Leaf? Well, that seems to be the sentiment contained within the latest war of words between Ford and Nissan at CES 2011 and news releases. According the official Ford News release, Ford Motor Company unveiled today its all-new Focus Electric – the company’s first-ever all-electric passenger car. The zero-CO2-emissions, gasoline-free version of Ford’s popular small car is the flagship of the company’s growing fleet of hybrid, plug-in hybrid and all-electric vehicles coming to North America and Europe by 2013. 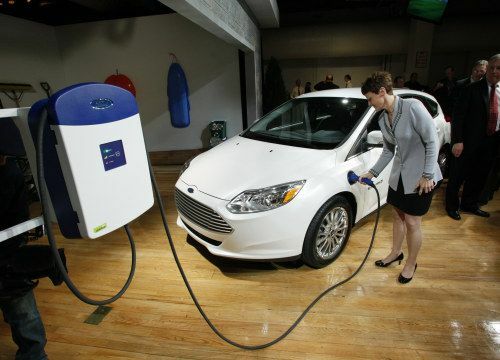 Ford Motor Company (NYSE: F) says its 2012 Focus Electric car will require half the charging time as the Nissan Leaf electric sedan while offering a comparable driving range on a full charge. And Nissan wasn’t happy with the comparison. According to Sherif Marakby, Ford's director of electrification, the Focus Electric will require just a three- to four-hour charge on a 240-volt home outlet charging station. It then reported it takes up to seven hours to charge a Nissan Leaf at a 220- 240-volt charging station. Then Automotive News reported in an article that there are two sides to that argument. You would think this was middle school, reminiscent of the old Mopar vs. FoMoCo vs. Chevy battles of the ‘60s. AN then reported that Nissan countered that it chose a middle of the road with its standard charger, and that it counted on nightly charging; so, speed was not an issue. Nissan picked a 3.3-kilowatt charger for the Leaf, because it was the best fit from a packaging and value standpoint. Wait, though, there’s more. As the electric vehicle market matures, Nissan realizes quicker charging solutions will be needed for faster lifestyles. So, to meet that demand, Nissan will also offer the option of DC Fast Charge, which charges the Leaf to 80 percent capacity in under a half hour; plus Nissan intends to continue exploring faster home charging options. For the record, the Nissan Leaf display at 2010 NAIAS Electric Avenue showed a 480V plug in the front of one of the cut-away vehicles. So, Nissan’s counter has merit. All this looks like a lot of bickering over gaining every bit of marketing strength as the 2011 NAIAS unfolds on Monday with press week. Let the war of words begin, just like the old days! Nissan Leaf actual charge time: 7 hours using L2, 30 minutes using L3 Ford Focus EV virtual charge time: 4 hours Ford Focus EV actual charge time: 2 years + 4 hours What battle?